In celebration of my inaugural blog, I decided to go out an try a new beer. For those of you who are interested in sampling a different beer, but are hesitant to invest in a whole six pack, World Market has an excellent selection of “buy by the bottle” beers. The six pack ran for $8.99 and the bottle by itself was just under two dollars. I prefer to drink the more hop heavy beers and IPAs at just below room temperature. As with wine, coldness kills the flavor. Since I bought the beer off a shelf and not out of a cooler, it was ready to drink when I got home. Everyone has their own preference on drinking styles. If I’m drinking beer from a bottle, I prefer to pour it into a glass. Since I do not have any specialty beer glasses, I tend to pour the more aromatic beers into my larger wine glasses. Don’t laugh. It really does make a difference. Upon pouring the HopDevil Ale into my giant wine glass (and I do mean giant), a pleasantly familiar aroma of hops invaded my nose. As you can see in the picture I’ve posted, the color is a beautifully rich amber with a nice soft caramel foam. The flavor of the beer held up to its promise. The bitterness of the hops, although very present, was not too overwhelming, allowing the richness of the German malts to really come through. The beer was excellent to sip on, and made a great pairing with some roasted and lightly salted almonds. Really hit the spot after a long day at work. 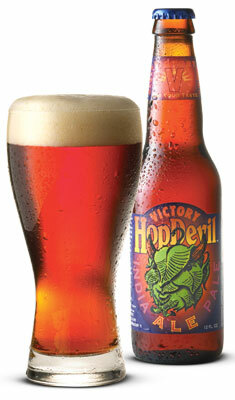 After checking out Victory’s website, it is apparent that I must try their seasonal beer entitled “Hop Wallop”. The problem will be finding it. I will keep you posted on my search. So what exactly are these hops that I know and love so much? Basically, hops are the female flowers of the hop plant, also known as Humulus lupulus. Hops are dioecious, which means they have separate male and female plants. Only the female produces the flowers that are used for brewing. The hop plant is a perennial spiraling vine which will grow in almost any climate given enough water and sunlight. Hops are native to the temperate zones of the northern hemisphere. They are found wild in Western Europe, Asia and certain parts of North America. Hops are typically green in color with yellow lupulin glands down between the petals. What exactly are lupulin glands? The fine yellow resinous powder found upon fruit of hops, responsible for the bitterness of hops. There are several varieties of hops, which are usually broken down into two categories: bitter hops and aroma hops. Traditionally, the term “Noble hops” refers to four varieties of hops low in bitterness and high in aroma, which often are the distinguishing characteristics of European-style lager beer. They are grown in four areas within Bavaria or Bohemia and include Hallertau Mittelfrüh, Tettnanger, Spalter, and Saaz. Why add hops to beer? The major contribution hops give to beer is a characteristic bitterness that provides a counterpoint to the rich sweetness provided by the malt. Hops have to be dried before they can be used in the brewing process. Traditionally, the hops drying process takes place in an oast. The bitter flavor is extracted from the hops during the boil, through the release of hop resin, which is a plant secretion containing essential oils. Hop resins are composed of two main acids: isomerized alpha acids and beta acids, both contributing to the bitterness of beer. Bitterness is not the only gift hops brings to the beer making party. The volatile oils are also an important flavor component of many types of beer. The essential oils are what give hops their unique aroma, which each variety having its own distinct profile. The amount of bitterness and oils in a beer differs based on the hops variety and concentration used as well as the time and frequency in which they are added. By adding different varieties of hops at different times during the boil, a more complex hop profile can be established, giving the beer a balance of hop bitterness, taste and aroma. The five main types of hop additions are: first wort hopping, bittering, flavoring, finishing, and dry hopping. The International Bitterness Units scale, or simply IBU scale, is the most typical, and probably the most accurate, measure for the bitterness of beer. An IBU is defined as 1 mg/l of iso-alpha-acid in a solution. Hops were not originally use to add bitterness and aromas. Hops are a natural preservative and part of its early use of hops in beer for preservation. Hops were added directly to the cask after fermentation to keep it fresh while it was transported. This is how my particular favorite style of beer, India Pale Ale, was developed. At the turn of the 18th century, British brewers began shipping strong ale with lots of hops added to the barrels to preserve it over the several months voyage to India. A great source of information on hops is Norm Pyle’s Hop FAQ.